A race of four-eyed bipeds native to the world of Khar'shan, the batarians are a disreputable species that chose to isolate itself from the rest of the galaxy. The Terminus Systems are infested with batarian pirate gangs and slaving rings, fueling the stereotype of the batarian thug. It should be noted that these criminals do not represent average citizens, who are forbidden to leave batarian space by their omnipresent and paranoid government. Despite several disagreements with the Citadel and simmering hostility toward humans, most batarians prefer profitable pursuits such as drug running and slave grabs to out-and-out warfare. They have a reputation for being shrewd businessmen and merchants, though in more lawless regions of the galaxy like Omega, negotiations with a batarian are likely to be conducted at gunpoint. The batarians are a species that are socially not unlike humans, and as such have a political rivalry with the human Systems Alliance, with whom they compete for unclaimed territory. The batarians have a slimmer build than the average human but are about the same height, on average, as a human. They have four eyes, one inner set located approximately where that of a humans would be, and a second pair stemming from "stalks" on the side of their heads. They also have slits for noses and no lips. Batarians used to have an embassy on the Citadel, but they closed it in protest of the council's decision to allow human colonization to continue in the Skyllian Verge, an area that the batarians considered within their sphere of influence. 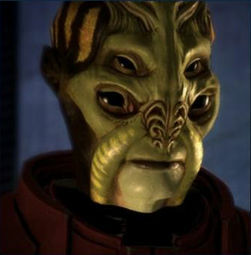 As a result, the batarians have essentially placed themselves at odds with most of the other Citadel Council races and particularly the Systems Alliance. This rivalry has led them into something of a proxy war with the Alliance, with the Batarians using their influence in the chaotic Terminus Systems (especially in areas bordering Alliance space) to foment political instability and criminal activity that could eventually cause problems for the Alliance. As a result, Batarians have many contacts with and in many cases are in direct control of galactic organized crime syndicates and terrorist groups. Most binocular visioned species feel uneasy looking at the face of a Batarian. They often seek to use this to gain an upper hand in deals and negotiations. Batarians place an extremely high value on social caste and appearance, and overstepping one's place is frowned upon. Casting aspersions on the monetary worth of a social better is considered a serious insult. Batarians strongly believe that species with fewer than four eyes are less intelligent; they often gain the upper hand in interspecies arguments because other races find it difficult to know which eyes to focus on when speaking to them. Batarians think of themselves as the “better race”, so they tend to be arrogant toward other species - and intentionally hostile and discriminatory toward humans. Batarian faces are covered with short, fine hairs that grow longer and thicker around the mouth. Their most distinctive physical feature is their four eyes, an uncommon trait among other races. Batarians also exhibit different skin tone colors: while most encountered batarians are a dark, brown-red hue with pale facial ridges, at least one, Balak, has what appears to be a black and yellow striped pigmentation with light green facial ridges. Little is known about batarian religious beliefs. Treatment of the corpse is considered unimportant, unless the batarian's eyes have been removed by an enemy. It suggested that the batarians' religious beliefs are based on words from sacred texts. There are some known batarian biotics who are trained as shock troopers and sentinels. For batarians it is possible to use their sets of eyes independently, giving them advantage while searching and reacting to abrupt situations. All batarians have a +4 bonus to Search. Because of their viscious and bloodthirsty history, Batarians gain +4 to Intimidate rolls against Humans and +2 to against other species. Batarian entry on Mass Effect Wiki.